RANDOM ENTERTAINMENT: Jordan Farmar Changes Jersey # to 1?! Jordan Farmar Changes Jersey # to 1?! 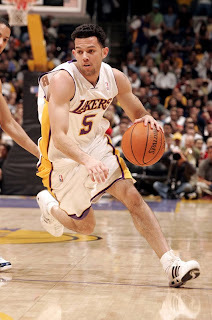 Per Eric Pincus of HoopsWorld.com, Jordan Farmar will be switching jersey numbers this upcoming season. Farmar – who, by the way recently changed his jersey number to “1″ – is eager to prove his individual talents in a system that doesn’t really cater to that. That may not work if he’s not willing to defer to team. Farmar has had lingering issues regarding his attitude, and (some say) cockiness. Although it might be a stretch, who isn’t expecting a few jabs at the number change?